The first European roadshow of fourteen textile machinery manufacturers took place on October 18th in Bogota and the following day in Medellin. With more than 100 Colombian textile producers attending, the roadshow exceeded the expectations of organizers including Belgian (SYMATEX), French (UCMTF), Spanish (AMTEX) and Swedish (TMAS) textile machinery associations. The organizers were particularly thankful to ALCOTEX (the Colombian Association of Textile Techniques and Professionals and of Dressmaking) and ANDI (the Colombian association of entrepreneurs), which helped organize and promote the events. The event format included a 15-minute presentation by each machinery manufacturer. In parallel, a mini fair was held where they showed animated videos of their machinery running at client’s sites and showcased textile samples produced on their equipment. They were available to develop business cases and personalized technological solutions. 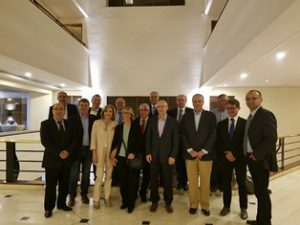 The four associations are very satisfied with the results, and will continue to explore the format and collaborate among European textile machinery associations to showcase the latest technology in various markets.